A deleted and forgotten presentation from the site of a Dubai company reveals the real scale of the hidden empire “Peevski”. According to the document, the company TGI Middle East FZE manages assets of over 700 million US dollars. They are distributed among several companies associated directly or indirectly with the former head of the National Security Agency (DANS) and lawmaker Delyan Peevski – “Bulgartabac”, “Yuri Gagarin”, “Express Logistic & Distribution” (ELD), “Tabac Market” (the newspaper stands and convenience stores Lafka), “Lakrima” (dairy products), “Doreko Commerce” (materials for the printing industry) and the IT-company “BG Business Solutions”. In total they, along with their assets, are valued by the owner at 450 million US dollars. To this amount, he adds real estate for 300 million US dollars that “diversify investments and risks to development”. Bivol checked diligently and carefully all public information on companies listed in the hidden presentation and was able to confirm the existence of a formal connection between them. The network is deeply concealed, but we managed to uncover the compelling links in it that reveal its common genesis and management. It is a fact that the sites of all companies from the portfolio (except “Yuri Gagarin”) are served by the same place and have a common name server for their Internet domains. It is ns.infosecbg.com, which belongs to “BG Business Solutions” (BGBS). This also applies to the domain of the parent company – tgimiddleeast.com. The BGBS domain, in turn, is owned by “Bulgartabac Holding”. The domains of the group of companies TGI Middle East are registered and managed by one place and by the same administrators, a check in the archives of the whois system revealed. The same administrators with “Bulgartabac” email addresses are referred to as contacts for the domains. The practical side of this concentration is that one keyboard stroke could make disappear from the Internet a business for 1.5 billion Bulgarian levs; stop sites, mail servers, and all of the online activity of the group. There is other documentary evidence of the connection between the companies. The Trade Registry lists documents showing that TGI Middle East FZE owns a Singaporean company that has bought “BG Business Solutions” from Doreco Limited, owner of “Doreko Commerce”. TGI owns the Singapore company BG BUSINESS SOLUTIONS PTE. LTD., which owns the Bulgarian BG Business Solutions. TGI Middle East FZE is also the second to last link in the chain leading to the majority shareholder “Bulgartabac Holding”. This is officially declared before the Commission for Protection of Competition (CPC). “Bulgartabac Holding”, in turn, has a share in “Tabac Market” and ELD belongs to its subsidiary company “Blagoevgrad-BT”. As an investigation by Bivol revealed, the distributor of the production of “Lakrima” in Dubai is also associated with TGI Middle East through its manager Rahul Datraya Nimkar, who has also entered himself as a representative of “Bulgartabac” (see here). It is not clear where the last company in the chain is registered. The CPC officially claims that Prest Trade in turn belongs to an individual. However, this person has no commercial activity and therefore his/her identity cannot be disclosed, says the Commission in its decision from June 26, 2014. Cartoon by Hristo Komarnitski – published with the consent of the author. Two years later, in May 2016, upon a request by Bivol under the Access to Public Information Act (APIA), the CPC once again refused to reveal who is that person, citing trade secret, but confirmed that a new offshore company named Stiga Anstalt has replaced Livero Establishment as the owner of the Austrian BT Invest Gmbh, which in turn is the formal owner of 78% of the shares of “Bulgartabac Holding”. The same individual remained the end owner of Stiga Anstalt through TGI and Prest Trade, therefore, there was no need for a new concentration probe. So, without conducting commercial activities, the mysterious individual has achieved an impressive economic performance, according to the presentation by his company. The presentation by TGI does not list the “Tehnomarket” business which Delyan Peevski acquired through his company HCH Investment and sold to TGI Middle East FZE late last year. Since the beginning of 2017, “Technomarket Bulgaria” is owned by TGI Middle East. It is hardly a coincidence that the father of lawyer Geno Rumenov Andreev, who has signed under the deal as President of the General Assembly, is the magistrate who in the past nominated Peevski for a job as investigator. The probable reason for this omission in the presentation is that it was created before the above deal. The metadata in the file shows that it was last changed in August 2016. According to our insider sources, the secret presentation was prepared for the conclusion of a large property deal in the Middle East, which did not take place and the document was removed from the Internet. This transaction between a company owned by Peevski and TGI is the crossing point between the hidden and the evident property of “the successful young man”. 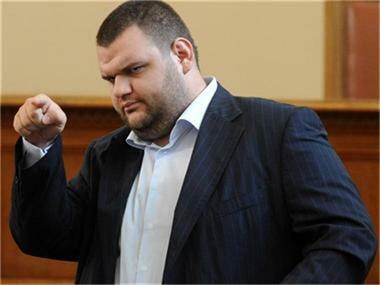 Until May 2015, Peevski had not officially declared any assets (with the exception of his infamous old “Opel” automobile), although he had been mentioning in public his “family business”, referring to the property of his mother Irena Krasteva (see end of article for the chronology of his property declarations). The first declared acquisition by Peevski was massive: 50% of “Balkan Media Company”, 50% of “Bio Water Investment” Ltd., 49% of Al Entisar General Enterprises Co LLC and 90% of “NSN Investment” LTD. There were numerous transfers of companies in 2016 until the current state of affairs, which seems to have stabilized in recent months, was reached. Meanwhile, Peevski parted with all his offshore companies except Dubai Intrust Ltd and Proof Method Marketing, registered at an unknown location. He sold “NSN Investment” and all media and distribution companies that his mother, Irena Krasteva, had given him as a gift. Finally, he transferred the very “NSN Investment” to Intrust Ltd. Therefore, all his evident ownership is now concentrated in one Dubai firm. The controversial deal for the so-called Boyana Diplomatic Club in the capital Sofia suburb of Boyana, which was sold for a symbolic price to three unknown young people from the city of Stara Zagora, ultimately resulted in the transfer of the ownership in “Doreko Commerce”. While the offshore is hidden behind two other offshore companies, its links with the business of Peevski are obvious. “Doreko” also acquired several years ago the ownership of the printing house “IPK Rodina”, which is directly related to the media empire of Peevski. The parent company of “Doreko Commerce” – Doreco Limited – is the owner of the advertising agency of “Bulgartabac” – “Soda Communications”. The latter also clearly reveals a direct connection and a common ownership center between TGI Middle East FZE and “Bulgartabac” and the curtain becomes completely transparent with the same well-known corpulent silhouette lurking behind it. Anyway, the question of the transparent and legitimate origin, the acquisition and export of over 1.5 billion levs-worth of assets of Bulgarian entities abroad remains open, as well as the one about the central figure that owns the said entities and assets. In its investigations, Bivol identified so far three sources of money for the acquisitions of the corpulent family: loans from the now-collapsed Corporate Commercial Bank (CCB), cigarette smuggling and commissions from public procurement. The initial capital came from loans from CCB in the period when its majority shareholder Tsvetan Vassilev and Delyan Peevski were unofficial business partners, according to the confessions of Vassilev, himself. The loans were never repaid to the CCB after the bankruptcy of the bank. A research by Bivol in data from the Credit Registry showed that there was a transfer of loans from CCB to First Investment Bank (FIB). Now, companies connected with Peevski owe hundreds of millions to FIB and continue to carry out their business plans with its help. Detailed investigations by Bivol since the beginning of 2014 into the purchase of the media outlets from the press group “Monitor” also proved the specific mechanism of the early mass media seizure by Peevski and his mother Irena Krasteva. This was the beginning of the full media empire of the young oligarch and its transformation into a system of propaganda and public executions in the “dazibao”style against anyone seen as inconvenient for the criminal status quo. As a result, Bulgaria collapsed to the last place in Europe in freedom of speech and is ranked by this indicator of democracy between Guinea and Zambia. With the money obtained from CCB – the former “darling bank” of three governments that fed it with taxpayers’ money through deposits of public enterprises – Peevski became a mentor of the Bulgarian print press and a monopolist in newspaper distribution. After the deliberately-brought-about bankruptcy of CCB with the pressure by the political and judicial lobby around Peevski, the former assets of the bank are being plundered by the appointed trustees (as revealed in Yaneva Gate), private law enforcement and indifferent State institutions and are turned into assets of companies and entities mainly connected with the corpulent oligarch. So, de facto, the capital of CCB was used twice for the creation and expansion of the economic empire around the irremovable MP from the party largely representing the Muslim minority – Movement for Rights and Freedoms (DPS) – and for turning it into a sinister backstage rule, imposing a repressive regime on all dissenters. The second source is a raging large-scale cigarette smuggling by “Bulgartabac” to the Middle East. It existed even when Bulgartabac was owned by the State, but under Peevski it acquired such dimensions that Turkish and other special services have identified it as a threat. Details about the protagonists in this illegal activity can be found in the series of investigations by Bivol titled “Bulgartabac Mafia” (see here). The third source is large public procurement contracts for infrastructure projects awarded to companies controlled by Peevski, mainly “Vodstroj 98”. A check by Bivol in the open data from the Public Procurement Agency established that companies associated with the corpulent MP have participated in procurement worth over 1 billion levs. With a commission of 30-40%, this has contributed to the enrichment of the group with nearly 400 million levs, while taxpayers get in exchange poor quality infrastructure that is also dangerous for their health. It is indicative that after the publication of these data by Bivol and sending it to OLAF, the then- and now-incoming Prime Minister, Boyko Borisov, suddenly stopped the huge public contract for the “Hemus” highway, citing some imaginary research he had conducted on his own: “I checked somewhat who is who”… Indeed, according to information from Bivol sources, Brussels had firmly stated that another treat for Peevski will not pass just like that this time around. Let’s go back to the accumulated wealth, trumpeted in the presentation of TGI. In its series “Bulgartabac Mafia”, Bivol published a document for a deal between TGI Middle East and then-controlled by banker Tsvetan Vassilev company EFV. EFV has reassigned to TGI its property in Bulgartabac against 45,414,388 euro. The origin of this amount is unclear. It is possible that the money came from criminal smuggling of cigarettes by Bulgartabac in the Middle East. But the documented transaction was signed for TGI by the then-Director of Bulgartabac and BT Invest Ventsislav Cholakov. What lies behind this connection of Cholakov with TGI Middle East is an important and still outstanding question. What is clear so far is where and how the lawmaker’s (who just won another seat in the new Parliament) ownership is concentrated, along with the dummies in the structure. However, many other questions also remain: How a person without business activity can acquire assets worth about 2% of Bulgaria’s gross national product? What is the origin of his money? Were taxes paid on them? Are they related with criminal activities such as cigarette smuggling? It is the Prosecutor’s Office that should respond to all questions listed above. This time, it will be approached by Bivol about the particular role of Ventsislav Cholakov and that anonymous “person” known to the CPC, who is the owner of TGI. We will turn not only to the Bulgarian Prosecutor’s Office, because, as we have learned from experience, it has almost no credibility, but rather acts as an accomplice. Based on all of the above, we are convinced that there are grounds for a new investigation. The previous investigation by the prosecution ended in March 2015, and since then new circumstances, witness accounts and documents emerged. For example, banker Tsvetan Vassilev was forced to flee abroad to save his life and at the moment his public and irrefutable evidence of the mafia rule is being marginalized by the Bulgarian Prosecutor’s Office.